I have been planning this post for quite a while! I wanted to talk to y'all about my thought process and why I had my room look the way it did. A few other girls and I decided it would be fun we showed you our tips and tricks and paired it up with a giveaway (Giveaway is now closed)! 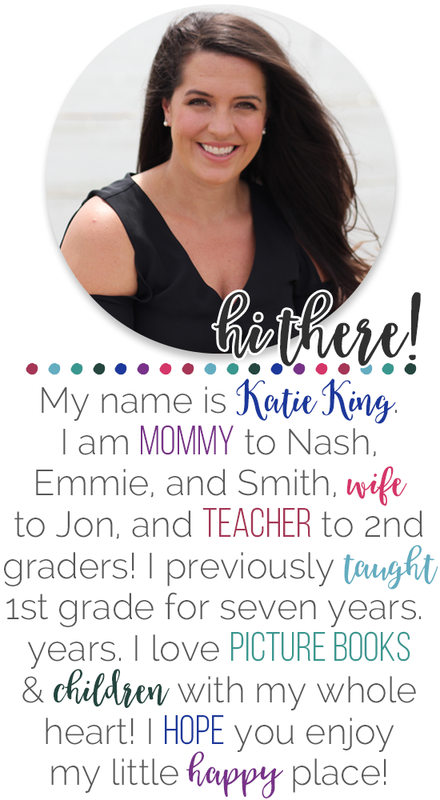 At the end of the post you will get links to FIVE other classroom posts that will help you when planning out your room! I have ALWAYS loved black and white in my classroom, but when I first tried it about 6 or 7 years ago it was a bit of a mess. I had a few zebra print things and went with a jungle theme. Well y'all know how that goes, once you start a theme, everyone tries to shove you into it even further. People were giving me everything they could find zebra print until my eyes crossed. So when I moved to South Carolina three years ago, I banned any and everything zebra print and decided to go more towards just black and white with pops of purple and aqua. I absolutely DID NOT want a theme. I was super blessed to find a job at a newly built school with enormous windows and tons of natural light. Here's a picture to show you what I mean. I actually felt like there was SO much light and white, that I needed the black to even it all out. Sooooo, that is how I ended up with black bulletin boards. The space to the left of my SmartBoard was actually one HUGE white board. I didn't really know what to do with it my first year so I just divided it will borders and wrote on it. This year I split it evenly into three boards and because I am really OCD about color, I knew I needed to alternate those boards with black and white. I went to Hobby Lobby and bought the thickest, blackest fabric I could find. And y'all don't tell on my but I hot glued it up. It peeled right off when I needed it to so don't worry. Then I used black polka dotted border and the aqua border from Schoolgirl Style to finish them up. My favorite thing about the black bulletin boards is that all my content POPS off of them. I feel like my kids are able to focus on them better. 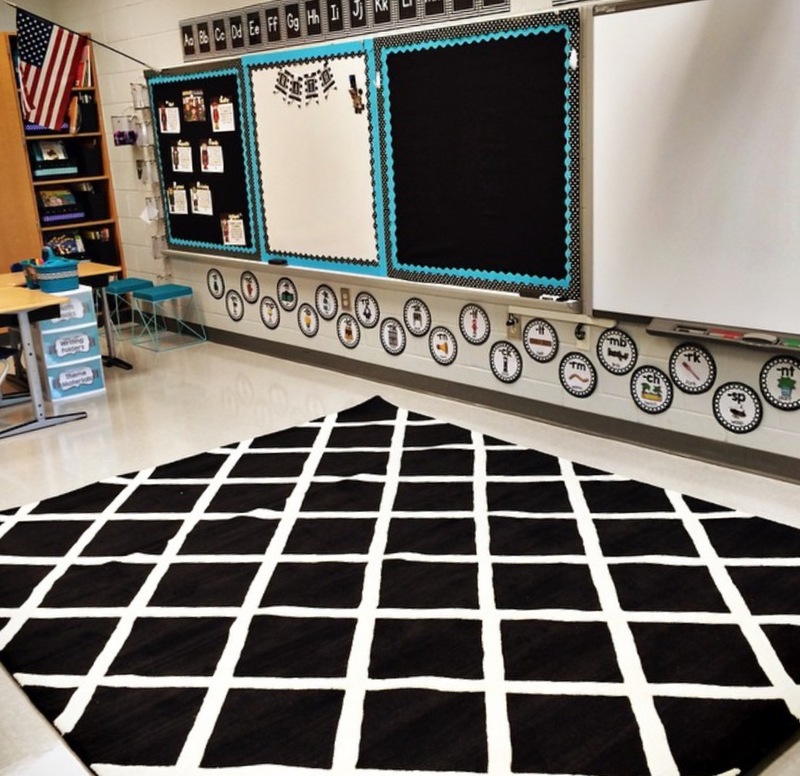 Now if you have an already dark classroom, it may not be the best thing for you! 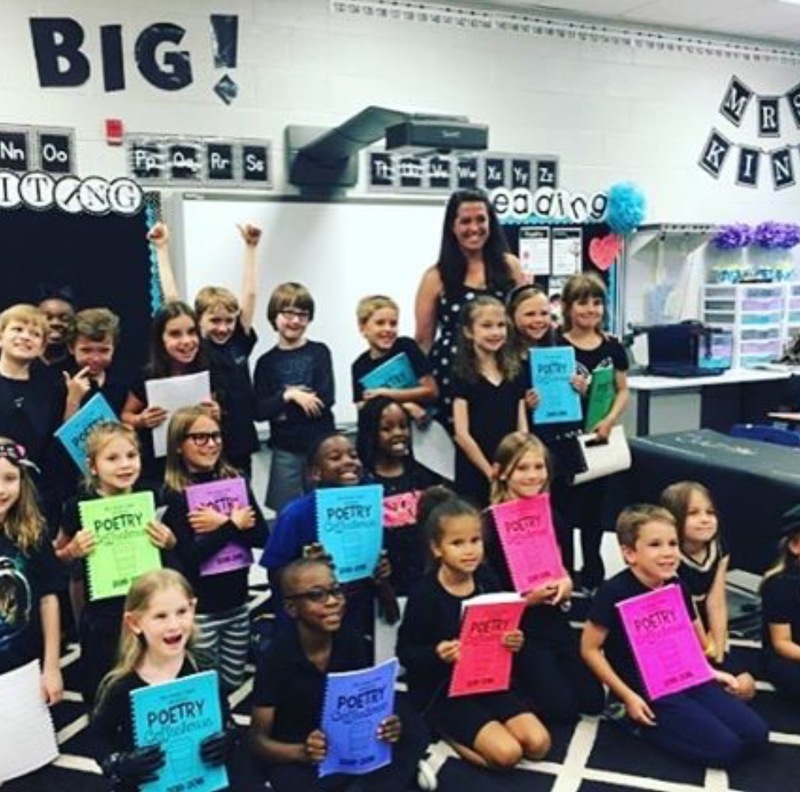 The last reason I really love the black and white is that it is super easy to "clean it up" for special occasions so that your students become the center of the attention and not your classroom! Here my classroom is ready to go for a special occasion. My students walked the Red Carpet in front of their parents to read their published fiction pieces. And then just another quick one. Here is my last class on our Poetry Coffeehouse Night. Those Astrobright poetry books really popped! This past year I decided I wanted something even more eye catching in my room. I wanted my kids to remember that there is more to life and school than memorizing facts and figures. I wanted them to remember that school could help their dreams come true! And just because I love y'all and I know I will get questions, these are the flowers above my desk. I made them myself with dowel rods, tissue paper, ribbon, and galvanized buckets. It took a little playing around with to figure it out but I absolutely loved them and they added a pretty element and pop of color to all the black and white. Don't forget to check out these gorgeous classrooms! Black and white is so classy! I especially love how you added in some pops of color with the aqua and purple. The DREAM letters on the fans is so creative! Where did you get your letters that are the headers for your bulletin boards and the ones that make your name banner? Did you make them or buy them pre-printed?